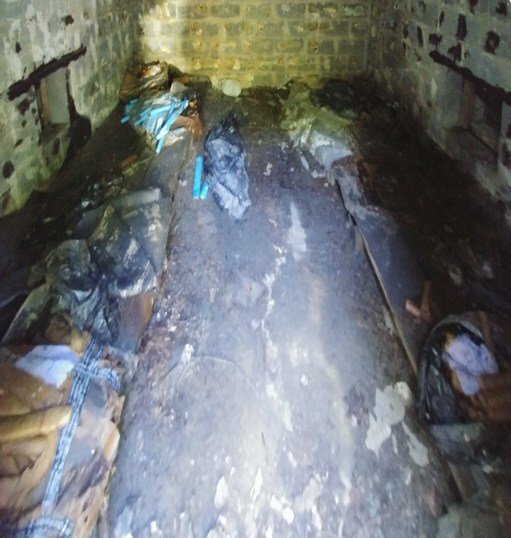 Initial situation - over 350lb of old Dynamite with leaking NitroGlycerine adding to the hazard in an abandoned coal mine magazine. Magazine at end of project - Nitroglycerine destroyed, Dynamite safely removed and destroyed, no hazard remaining. Explosives including dynamite, watergel and blasting caps were found abandoned in a storage magazine at a closed coal mining site. Residential properties were located about 100 meters from the magazine and an animal shelter just 55 meters away. The State of West Virginia immediately took action to insure public safety and called upon RAM, Inc. to render the site safe. Upon inspection, it was observed that the packaging of the dynamite sticks at the top of the pallet had deteriorated with weeping and sweating of nitroglycerine (NG) on to the intact dynamite below and on to the magazine floor. The dynamite was seen to date from 1984. The NG and the bulk dynamite posed an extremely high explosive hazard to recovery and neutralization efforts. 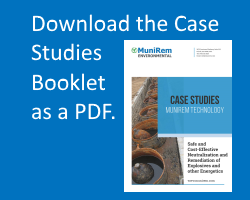 After careful evaluation of potentially safe and environmentally sound solutions for recovery and destruction of the explosives, the use of MuniRem Reagent was selected as the safest and most cost-effective alternative by both state regulators and the prime contractor, RAM, Inc. The West Virginia Department of Environmental Protection made a 4 minute video about the project. West Virginia State Police closed the roads to the work area during operations and the residents of the two nearby homes were evacuated prior to the start of work. Two formulations of MuniRem Reagent (MuniRem-R811E and MuniRem-FE) were shipped to the site along with HDPE drums and safety equipment. A carbon filtration cannister was provided by RAM, Inc for the polishing of the generated wastewater to comply with state of W. Virginia regulations. A customized aqueous spray system was used to apply freshly prepared MuniRem Reagent solution on the interior of the magazine to neutralize the NG and any exposed explosive to render the magazine interior safe for entry and recovery work. The solution was then continuously sprayed as the intact dynamite and watergel sticks were recovered into pails of MuniRem Reagent solution. The recovered bulk explosives were transported to the neutralization station and destroyed in open treatment tanks that contained concentrated MuniRem Reagent solution. Complete neutralization of the explosives was confirmed in the field using EXPRAY test kits. 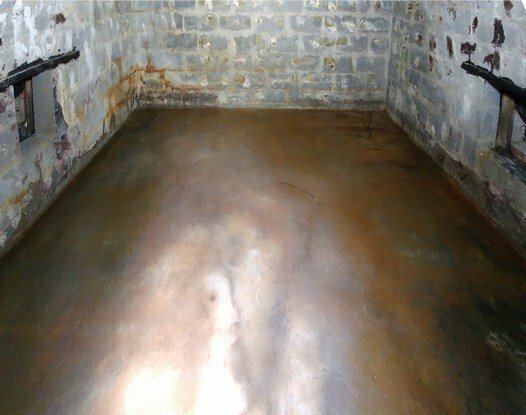 The wastewater generated from the neutralization process was filtered through a carbon filter prior to submission of samples for offsite analytical characterization. Application of MuniRem Reagents eliminated the explosive hazard and permitted in-situ safe handling of NG laden explosives. Degraded sticks of various classes of dynamite and water gel were rendered safe for transport to the nearby treatment station where final neutralization was completed. The generated wastewater was then characterized and disposed off-site as a non-hazardous waste. 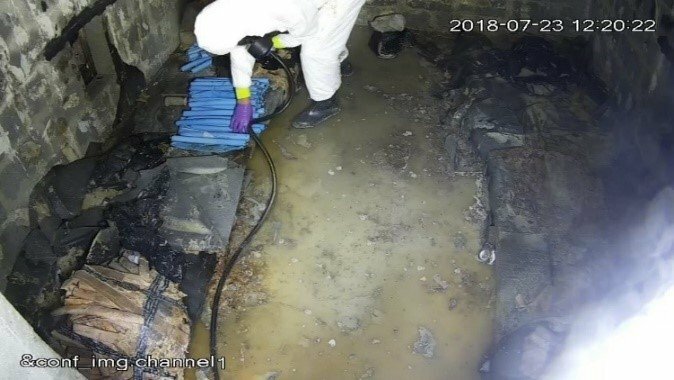 Excluding the undetermined amount of explosives neutralized in-situ, over 350 pounds of dynamite and watergel sticks were safely recovered and completely neutralized. The explosives recovery and neutralization tasks were both completed in 48 hours after mobilization. MuniRem Environmental, LLC and RAM, Inc. staff demonstrated that MuniRem is the best solution for the rapid and safe neutralization of nitroglycerine, dynamite and water gel. ← MuniRem Environmental, LLC signs Partner Agreement with RAM, Inc.